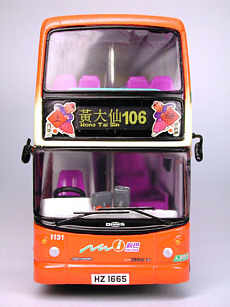 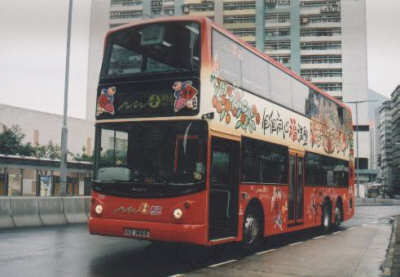 The model - this model was issued in Hong Kong on 8th February 2002. Quantities were reduced to 2,500. A pre-production example of this model can be viewed here. The bus - Dennis Trident No 1131 entered service in January 1999. 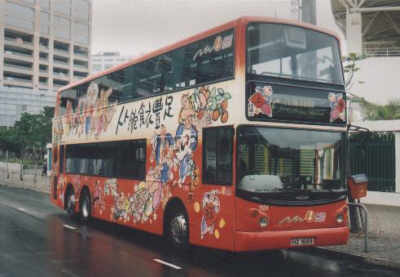 In January 2002 it received this special livery. 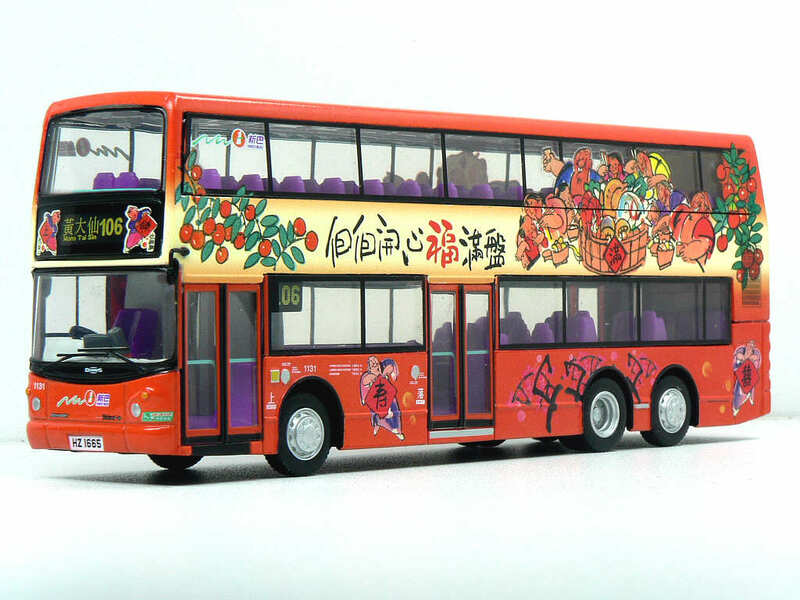 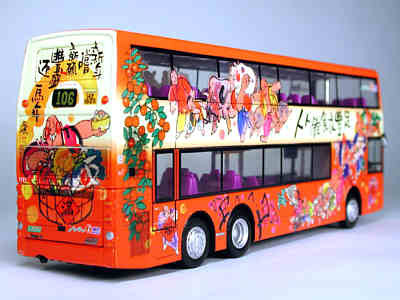 To make the message 'NWFB New Year Feast of Harvest' more eye-catching, NWFB invited Ah Chung, a renowned local wash painting artist, to design a series of artistic and joyful decorative items, including bus livery, bus stop, poster and ¡¥Fai Chun¡¦. 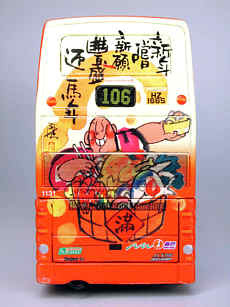 The orange bus livery was been painted with various cartoon figures in 'fortune-filling' faces, who gather to enjoy the tasty village feast, coupling with the key messages like 'To embrace a fruitful new Year of the Horse with good fortune', 'Everyone enjoys a fun-filling and fortune-filling fruitful new year'. 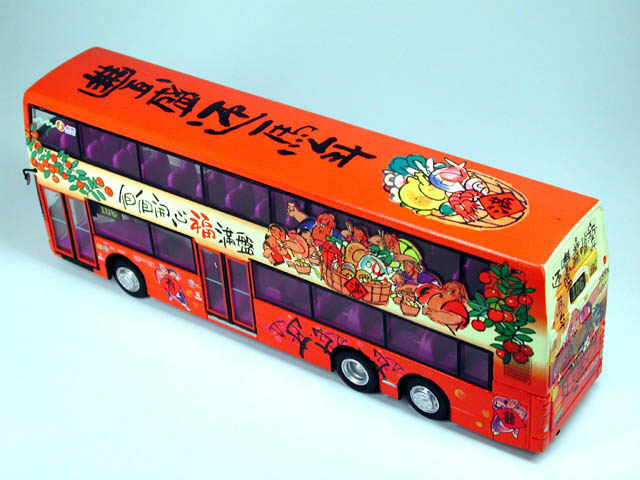 Also, 300 NWFB bus stops were dressed in cute decorative items to deliver NWFB new year greetings to all passengers.